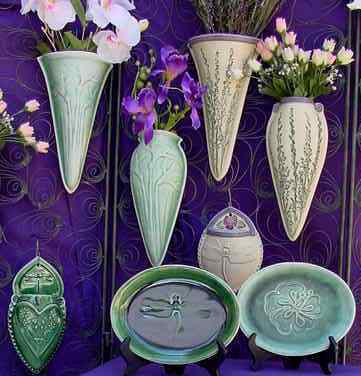 Annie creates one of a kind, functional Ceramic Art for home and garden in her Big Bear Lake studio. She uses soft, cool colors, and images and imprints from nature, creating an earthy, elegant look reminiscent of the Arts and Crafts era. All pieces are individually crafted out of durable, high fire stoneware and lead free glazes. Vases hold water for fresh flowers and can live indoors or out in the garden. Plates are food, oven, dishwasher and microwave safe. Annie's unique pottery is made by hand, from the heart, and is intended to bring you a lifetime of joy!